The level of propaganda emanating from the REMAIN establishment camp continues to be relentless. However, as my series of articles and videos have illustrated that virtually every piece of establishment propaganda fails to stand up to close scrutiny and one such piece of misinformation being regurgitated at length by the press is that of the British Pound coming under intense pressure following David Cameron's February announcement to hold an In / Out EU Referendum on June 23rd. The collective establishment mainstream press that includes the likes of the BBC, Channel 4 News and the myriad of dieing broadsheet publications such as the FT, all in near unison have been propagating headlines such as a 'Boris Johnson Causes a Run on the Pound' following a 3 cent dip against the US Dollar on supposed rising BrExit fears as though the fall in the pound was catastrophically bad news, and has remained the story peddled since Mid February. This despite the same clueless press only weeks earlier reporting on the likes of Japan implementing NEGATIVE interest rates in an attempt to PUSH the Japanese yen lower as each nation is engaged in completive devaluations against one another currencies so as to boost domestic demand by means of importing inflation and exporting deflation in what is commonly termed as the CURRENCY WARS. 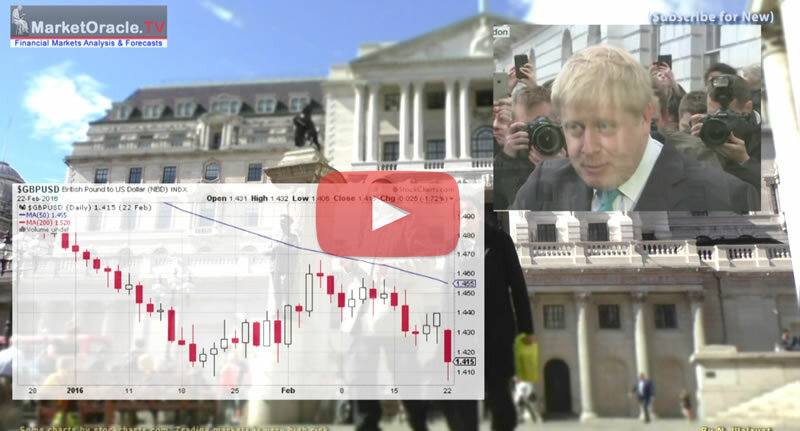 22 Feb 2016 - British Pound BrExit Plunge Press Panic! FACT: Helps Britain WIN Currency War! In terms of the technical picture for the GBP, yes sterling is clearly in a bear market, but the worst of the sell off was over a year ago, since which time sterling has been fairly stable, which implies rather than the current sell of marking the start of a new panic sell off stage, instead the downside is very limited and probability actually favouring sterling being nearer to 20% higher a year from now then 20% lower as the clueless mainstream press has been busy propagating today. And so the sterling collapse fear story has continued to be peddled by the establishment press for the past 3 months. So what has transpired during the past 3 months, has British Pound continued to collapse into the dark BrExit void? Well the British Pound was trading at £/$1.43 on the day David Cameron announced the date of the EU Referendum. Immediately trending lower to £/$1.3833 or down 3%, which is not exactly what one would term as a currency in crisis! However, of greater significance is that during the past 3 months that has seen a narrowing in the opinion in the favour of BrExit to stand virtually neck and neck on 44%, and despite the continuing relentless press FEAR headlines of a sterling crisis. 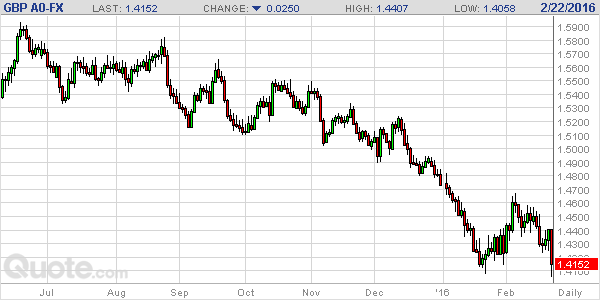 Instead the British Pound has RISEN, trended higher to currently stand at £/$1.46, up 5.5% from its Feb low. Therefore whilst the establishment press has been continuously pumping out the false stories of a plunging currency on BrExit fears, instead the reality has been one of the British Pound rising on BrExit hopes! And given the upward trend trajectory the British Pound could easily achieve £/$1.50 by June 23rd. So the bottom line is that in today's binary propaganda world, the establishment press and institutions only ever tend to see the days when the pound takes a dip as illustrated by their scare mongering headlines, all whilst ignoring the prevailing RISING TREND, because the markets well understand that the benefits of LEAVING the EU far outweigh the costs of REMANING in the EU, hence the British Pound has been on an upwards trend trajectory. In fact sterling's strength is an indicator that it is EUROPE that would suffer from a BrExit rather than Britain, which means expect sterling STRENGTH following a BREXIT rather than weakness as the whole EU project would be thrown into doubt and thus Britain would be seen as a safe haven as it is being today, which is the exact opposite of the garbage peddled by the likes of the FT and the Bank of England! EU Referendum BrExit - New Dawn? The latest EU referendum opinion polls put the LEAVE and REMAIN camps virtually neck and neck on 44% with 12% of those polled undecided. Which compares against a month ago of 42% LEAVE and 48% REMAIN, 10% undecided. So it is no wonder that the REMAIN camp has gone into full blown panic mode with a relentless torrent of fear mongering emanating from the establishment REMAIN camp. 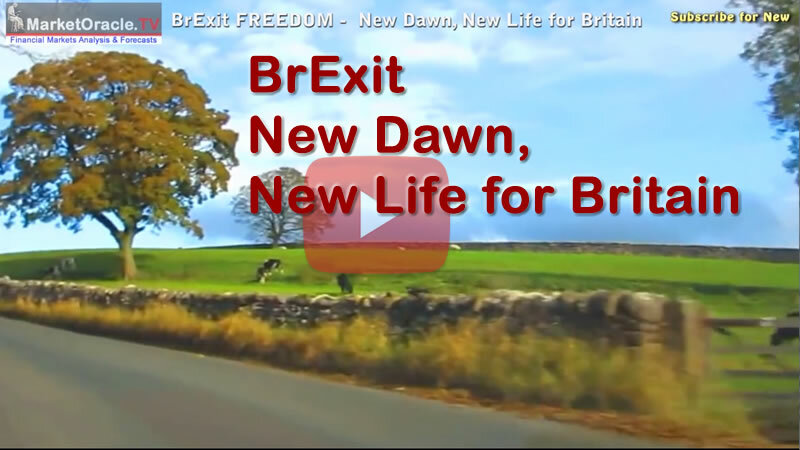 Instead I offer my latest video in this series as a message of HOPE, a message of a New Dawn, New Life for Britain, summed up in one word FREEDOM! With just 5 weeks to go the Market Oracle's own 9 month long BrExit campaign is being ramped up as we enter these last few weeks, producing pro-LEAVE resources from in-depth analysis, rebuttal article such as this, many videos, and active on the social networks so as to do our best to play a part in Britain achieving freedom which you can support allowing us to further intensify our campaign and rebuttals of the daily barrage of REMAIN propaganda as well as produce entertaining video's to help dissipate REMAINs smoke and mirrors propaganda.